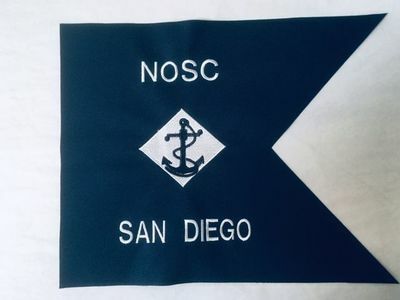 These miniature U.S. Navy guidons measure 9" x 12" and feature a fully embroidered Naval Infantry patch on a navy blue cotton fabric and unit designators on one side. We hot knife the flag edges to create a smooth finish that is perfect for framing as there are no raised hemmed edges to lift the matting. These small Navy guidons can be finished with the "swallowtail cut as pictured or they can be finished in a rectangular shape so that your framer can cut the swallowtail from the frame mat. These small scale embroidered Navy guidons are made specifically for framing and not suitable for flying. These very attractive "Framers Choice" mini US Navy guidons are a popular option for awards, presentation gifts, and retirements. We can also frame these guidons for you; visit our Framed Guidons section for more info.